Last night I had my friend Stephanie and her hubby Jean come over to the house to help me with a pet urine problem( yuck, I know!) Anyway,Jean used a black light to locate all the problem areas on the carpet. Once that was taken care of we used the blacklight to check out the monkey's bathroom. The blacklight points out all the bacteria on the surfaces. I was shocked!!! I proud myself in keeping our house clean, but I was very surprised how unclean my bathrooms really were especially the walls. That got me thinking about household cleaning products. I want my bathrooms to be clean all the time, but how can I do that and make it safer for my monkeys? 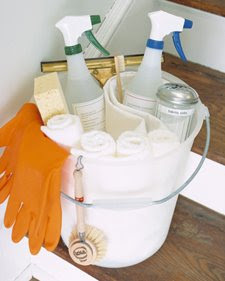 Well I found a great website on Homemade Cleaners. It was eye opening how many homemade remedies there are, and I plan on giving them a try. I like the idea these homemade products are less expensive than name brand cleaners, and less toxic for my family. I hope you check out this site, and try some of these great, safe suggestions.